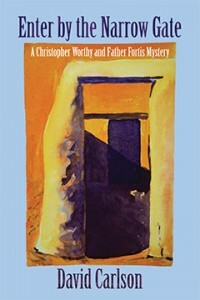 Enter by the Narrow Gate ($14.95, 244 pp, 6×9 Trade Paperback ISBN: 978-1-60381-391-4) is the first book in a new mystery/thriller series by David Carlson featuring Christopher Worthy and Father Fortis. After a nun is murdered while on retreat in a monastery, an Orthodox monk solicits the help of his Detroit Detective friend who is in Santa Fe investigating a missing person’s case. “Carlson takes great care with his depiction of the state’s history and culture even as he fictionalizes and conflates small details for dramatic effect. Every character receives this respectful treatment as well [….] The novel, while grounded firmly in theological and spiritual themes, is not a Bible-based mystery but an exploration of humanity [….] Lest anyone perceive Gate as a quiet book focused solely on the contemplative and monastic, rest assured that the mystery takes a spectacular twist. Lives are endangered, and the threat of the apocalypse hovers over a few of the characters, putting others high in the mountains at risk.” Read more…. “The real joy in reading this mystery lies in Carlson’s exploration of how faith shapes reasoning and actions, rather than simply the action itself. Thus Father Fortis can proudly take his place in a list of religious detectives that includes Father Brown, Brother Cadfael and Rabbi David Small.” Read more…. “A consistently compelling and entertaining read from first page to last…. highly recommended.” Read more…. Enter by the Narrow Gate is Carlson’s first novel. His first work of nonfiction, Peace Be with You: Monastic Wisdom for a Terror-Filled World was selected as one of the Best Books of 2011 in the area of Spiritual Living by Library Journal. His second book on religious terrorism, Countering Religious Extremism: The Healing Power of Spiritual Friendships, will be released by New City Press in 2017. The cover art is by Carlson’s wife, Kathy, a retired English professor and an award-winning artist. A teenage girl has vanished in Santa Fe. Nearby, in the Trappist monastery of St. Mary of the Snows, a beautiful young nun is stabbed to death. Father Nicholas Fortis is on sabbatical at St. Mary’s, and when Lieutenant Christopher Worthy of the Detroit Police Department is flown in to help find the missing teenager, the Orthodox monk asks his friend to delve into the nun’s murder as well. The two men make a perfect team: the monk’s gregarious manner opens hearts and the detective’s keen intuition infiltrates psyches. The Book of Matthew refers to the “narrow gate” that leads to heaven. Each of the key players in these two cases was rattling heaven’s gate in a frantic and even dangerous quest for salvation. Lieutenant Sera Lacey of the Santa Fe Police, with her captivating looks and insight into the Native Americans and cultures of the Southwest, proves both a boon and a distraction for Worthy. As Father Fortis navigates the social hierarchy of the monks of St. Mary’s, he begins to fear their secret agendas. Bowing to the pressure to solve both cases, the investigators let the clues lead them in opposite directions. At the end of one of those paths, Death awaits. In the darkness following the night service of Vigils at St. Mary’s, Father Fortis remained in his assigned stall and watched as the columns of monks processed toward the sanctuary altar. Each bowed deeply from the waist before the abbot, then turned to the icon of the Virgin Mary to bow again before filing out into the night. “Why next week?” Father Fortis had asked. Father Fortis’s heart had skipped a beat at the time, but now he wondered if it would take the police that long to link the murder with the Penitentes. A routine search at the county courthouse should show that the retreat house had previously been a morada. And how long would it take the police to figure out the meaning of the seven wounds between Sister Anna’s breasts? Sitting alone in the dark, he gazed out of the massive window at the rock face. Moonlight promised to break free of the crest line at any moment and illuminate the room. As he rose from his seat with thoughts of returning to bed, he heard a faint creaking sound from the balcony above. That was the area reserved for guests, but the monastery had closed its guesthouse to all but Worthy and himself until the investigation was over. He sat quietly, half expecting to see a sneaky reporter’s head peeking over the railing. He saw and heard nothing, yet something or someone was definitely there. He could feel it. Rising silently, he edged his way to the back of the chapel and to the stairs leading up to the balcony. He ascended cautiously, wondering if he was overreacting. Couldn’t the sound simply be the evening breeze as it flowed down the valley? He reached the top stair and peered into the dark balcony. He waited, but again heard nothing. At that moment, the moon broke free of the canyon wall outside and flooded the chapel with light. In that flash, Father Fortis saw three things. One, exploding in the clear desert night air, the bands of color on the far canyon wall. How odd, he thought, to see pinks, reds, even browns at this time of night. Two, in the same instant, he saw that the balcony was empty, its rows of hand-hewn benches bare except for a stack of daily missals. And three, he saw the door at the other end of the balcony swaying slightly.